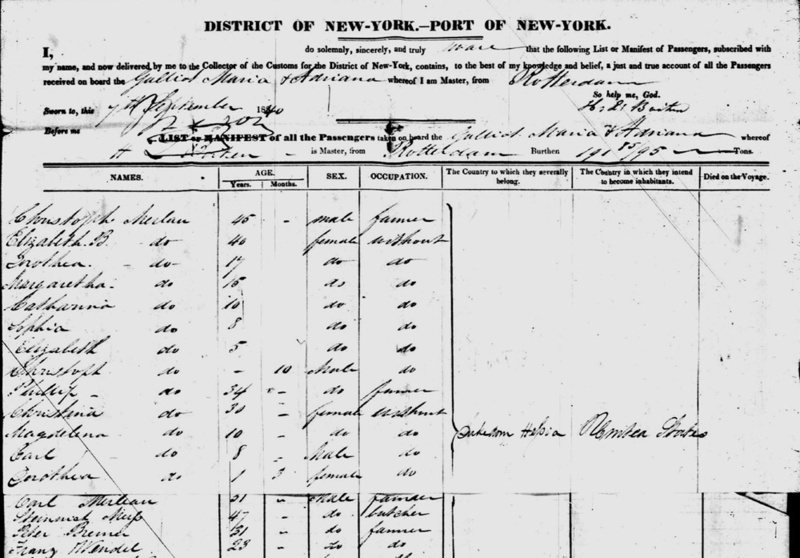 In 1840, Johann Karl Merlau came to America from Hesse-Darmstadt along with two brothers and settled in Sheldon, New York. It is there he met and married Maria Christina Zapf. Christina's family had immigrated to Sheldon from the Baden. Karl and Christina had seven children. i. Charles Frederick Merlau Charles was born on November 12, 18483,4 and he died in 19084. Charles married Mary Elisabeth Kopp. iii. John Christopher Merlau John was born on November 16, 18521. He married Mary Ann Heintz on April 7, 18741 at St. John's Evangelical and Reformed Church. Mary was born on October 19, 18561, the daughter of Johann Georg Heintz and Anna Maria Hoffman. iv. Augusta Merlau Augusta was born on September 17, 18546, and died April 21 18997. She married Louis Hoffower. Louis was born in June 18518.
v. Magdalena "Lena" Merlau Lena was born on July 5, 18561, and she died on May 5, 18801. She married George Kopp at St. John's Evangelical and Reformed Church. George was born on August 20, 18461, the son of Michael Kopp and Anna Maria Heberle. He died on June 9, 19121.
vii. Mary K. Merlau Mary was born in April 186110, and died in 19323. She married George H. Ismert. George was born on October 27, 18563, and died on April 21, 19263. Johann Karl Faulring was born on September 27, 18082, in Arheilgen, Hesse-Darmstadt, the son of Johann Christoph Merlau and Anna Catharina Rasch. At the time, Arheilgen was a farming community near the city of Darmstadt, the Ducal seat of Hesse-Darmstadt. He spent his formative years there, likely working on his family's farm. Today, Arheilgen is an urban district of Darmstadt. Then, in 1840, at the age of 21, Karl journeyed from Arheilgen to Sheldon in Wyoming County, New York11. He accompanied two older brothers, Johann Christoph and Johnn Philipp, and their families. After sailing on the galliot Maria and Adriana from Rotterdamm, Karl landed in New York City in early September11. The new immigrants probably traveled up the Hudson River by steam boat and then crossed from Albany to Batavia by train or the Erie Canal. The final leg of the trip was most likely by cart or wagon over roads to arrive in Sheldon. After their arrival in Sheldon, the Merlau brothers settled in the Towns of Sheldon and Wales. Since he was single, Karl, known in America by the English equivalent of his name, Charles, probably started life in America as a farm laborer, possibly working with one of his brothers. In this way, he would earn money to purchase his own farm. Charles and his brothers attended St. John's Evangelical and Reform Church in Dutch Hollow, a valley area on the western border of the Town of Sheldon. St. John's was the center of the local German, Protestant community and served their social and religious needs. It was in this setting that Charles met and married Maria Christina Zapf. Christina, who was born about 18205,12 in Baden, was the daughter of Michael Zapf. Charles and Christina settled on a farm on Goose Hill road, which leads up the west hill out of Dutch Hollow into the Town of Wales. There, Charles began a life of farming, which continued until his death1,12. Christina died on June 4, 18624, and Charles died on October 25, 18701.